You are here: Home / Food Storage / Fresh Food in Winter – Sprouts! Fresh Food in Winter – Sprouts! We do more sprouting in winter, when fresh local food is hard to come by, other than what's stashed in the root cellar or growing in a window sill. There are a ton of different sprouting seeds available, from hearty mung beans and peas, to spicy radishes, to salad and sandwich blends, to fun options like fenugreek, that make your armpits smell like maple syrup. 🙂 Sprouting is fast, easy and inexpensive – even a kid can do it, as demonstrated by my son below. My Cub (my eldest son) helped me start some mung bean sprouts up recently. Following the package directions, he measured out 1/4 cup dry beans and rinsed them until the water ran clear. The beans are then placed in a jar and covered with one cup of water. The jar is covered with a clean cloth or mesh (I use our econo-toppers , pictured below). The econo-toppers are inexpensive and easy to use, and make rinsing and draining a breeze. Drain, rinse and then repeat draining and rinsing every 8 to 12 hours, leaving in low light between rinses (not direct sunlight). Repeat for 2 to 3 days for little sweet sprouts, or 4 to 5 days for bigger sprouts (what you normally see in stores and restaurants). No need to rinse when they are ready. Here are our sprouts at 2 days old. Place sprouts in a bag or sealed container (we just put a regular lid on the Mason jar) and keep refrigerated. The sprouts stay good for 7 to 10 days. In the Indian Ayurveda approach to health,Mung Beans are one of the most cherished foods as it is believed they balance all three doshas. According to the American bean website,research has indicated that legumes to be the most important dietary predictor of survival among the elderly.A 20 gm daily increase in legume intake correlated to a 7-8% reduction in the death hazard ratio. The consumption of 4 or more servings/week of beans, decreased heart disease by 22% according to a US study of nearly 10,000 people. A Nurses Health study indicated the chance of developing colorectal adenomas (the source of most colon cancer) was 35% less likely among women who ate four or more servings of legumes a week. Those diagnosed with colorectal adenomas who changed their diets to increase their intake of beans the most, were 65% less likely to suffer a recurrence of advanced adenomas. The fiber in legumes have the capacity to combine with bile acids.The decrease in bile available for digestion may stimulate the body's conversion of blood cholesterol into bile resulting in lower levels of blood cholesterol. One phyto-nutrient unique to legumes are a group of molecules called saponins. Go to alfalfa and saponins for a more detailed discussion on the health benefits of these molecules. Unlike most beans,mung beans contain very few oligo-saccharides,the sugars responsible for flatulence.This unique biochemistry makes mung beans suitable for children and anyone suffering from delicate digestive systems. The amazing biochemical process of sprouting transforms this seed with already a number of significant health benefits into a superfood. Most people are aware of the mung bean sprouts, where the seed has germinated and is several times bigger than it's original size and the white radicle or root has emerged. It is often eaten in this form as a snack.At this stage the mung bean still resembles a pea in shape.The sprouting biochemistry has made available minerals,enzymes and Vitamins, in a form easily assimilated into the body. The sprouting process makes Vitamin C available which is not found in the seed. So if you are looking for a vegetarian source of protein (around 23%) dietary way of increasing your chances of living longer superfood suitable for delicate digestive systems way to decrease in your chances of suffering heart disease and colon cancer then mung bean sprout consumption bears serious consideration. Basic storage is Cool, Dry and Dark. 55-70° (f) with humidity of 70% or less will (based on our experience) result in shelf life as stated in this chart, though lower humidity is always desirable. Seed life can be maximized by freezing – which will increase shelf life 4-5 times or refrigerating – which will at least double it. In all cases it is essential that you avoid condensation – which could shorten a seed's life. So, if you haven't stocked on beany, sprouty goodness, I recommend giving it a try. Sprouting is easy, and they make a nice addition to smoothies, sandwiches and salads, especially at this time of year. If you have some dirt, some light and a little more patience, you can tackle “Sprouting – Level 2”. Some sprouts, such as peas, will present you with a longer, more substantial sprout harvest when transplanted into soil for a bit. I'm not talking about pre-sprouting to plant out in the garden. I tried that one year with sprouting peas seeds and they just didn't do very much. I'm talking about planting in soil simply to allow harvest of beautiful tender greens and tiny, tasty tendrils. You can jump start indoor green growing of any sort by pre-sprouting before planting. Sprout peas in a manner similar to mung beans. When green leaves appear, plant into shallow trays of soil. Recycled trays from organic salad greens work quite well. When sprouts are a few inches tall, pinch or snip off growing tops and use in salad. P.S – Don't forget – most sprouts have a very good storage life, making them one of my Top 10 Foods to Store Without Electricity. PPS – Mold on your sprouts? 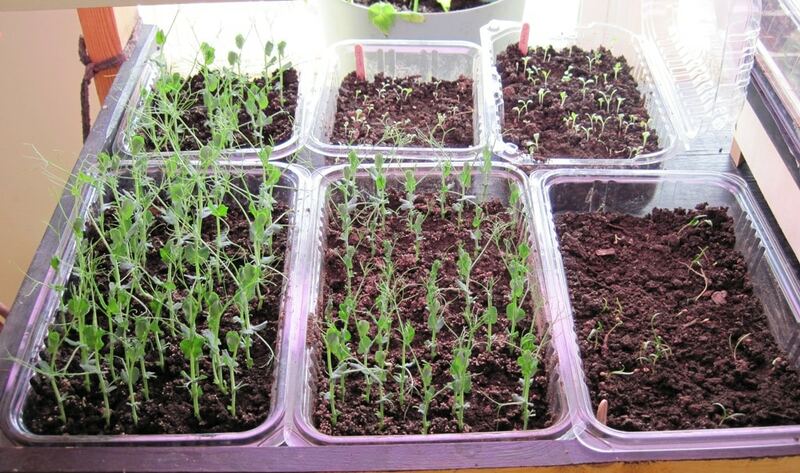 Check out “How to Prevent Mold When Growing Sprouts at Home“. Terrific post! At a raw foods seminar I was recently at they talked about how nutritious sprouts are and how they are even healthier than the mature plant. Thanks, Brenda. Glad you enjoyed it. I've been making more of an effort to eat more raw food year round, which can be tough with our long winters. Sprouts are a big help. Cool! My kids love to make the sprouts in our house. I love my sprouts – and I do mung beans, too. I just never took the time to look up all that marvelous information! Thanks for sharing! Now I've got to go get some beans soaking…good job, there Cub! I hope all is well out west. I'll bet you've got things planted already while we are still frozen. I was always a little afraid of sprouting because I heard you had to do a bleach rinse to the seeds to kill the bacteria. Do you every rinse? Do you grow alfalfa sprouts? I don’t do the bleach rinse, I do buy seeds from trusted sources and am careful not to cross contaminate in the kitchen. I have grown alfalfa sprouts in sprout mixes.